This article is about choosing a distinctively unique trademark or brand for your business. Selecting a good trademark is a thoughtful process. You need to spend some quality time for the same. Trademark registration gives legal authority to the owner of a business to use a specific logo or brand he has chosen as the unique identity of his business. So, he must be very careful and should choose one that will project his business distinctively among the competitors. Here are some useful tips to choose the right trademark or logo for your business. This is the most important and very essential aspect of choosing the right brand or logo for your business firm. Why you should study your industry? Is that necessary just for a name? Let me ask you back. How do you know what name you are going to choose if you didn’t understand your industry and competitors who are wearing some awesome brand names? How do you know that the name you have chosen is not similar to the already existing registered names? Keep in mind that a brand is not just for a brand; it is your identity. Brand registration or logo registration is a secondary thing. Knowing what you are going to do is the foremost. When you completely know your purpose you will be able to find your uniqueness. Understanding the scope of your trademark rights is critical to the trademark selection and protection processes. You understand the scope only if you understand what you are going to sell. As the American actress and author Lea Michele beautifully said: “uniqueness is what makes you the most beautiful.” Finding uniqueness in everything you do is the key to success. The case is the same in choosing a brand also. Try to avoid copying brands and logos that others have been using for their business. Legally, similar trademarks will not be registered. That is another matter. My focus is on a holistic uniqueness of your company. Experienced trademark specialists can help you develop a list of search terms, obtain comprehensive search data, and interpret that data in a meaningful way. 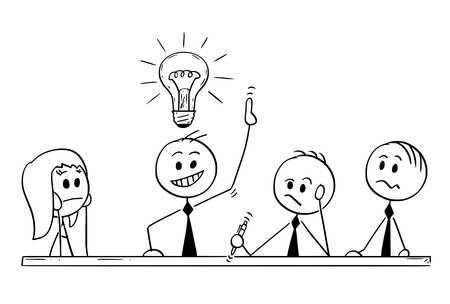 Creative brainstorming is a powerful source of idea generation. Invite your colleagues or employees for brainstorming inside or outside your office. You will surely come across some beautiful suggestions. As the famous motivational speaker and author Asa Don Brown states, “Brainstorming is the nexus of ideas.” Firstly, list out the unique names suggested by the members in the brainstorming session. Then take each and every one and choose the best as most of the members in the group think. Trademark registration helps you protect your brand from other business owners and ensure your complete authority and ownership rights. Trademark registration is an easy process in India. But, you cannot register any type of trademarks you want. Certain types of words are inherently difficult to register and should be avoided for brand registration. Such types of words are described in the following tips. The strongest kind of trademark is a coined or fanciful word that has no meaning other than as a trademark. KODAK is an example of coined or fanciful mark. It is a very famous brand for photographic supplies. Fanciful trademarks can be easily registered without any objection from others and can be protected in both competitive and noncompetitive industries. Coined brand names are also memorable and will help your customers remember your company name. Avoid descriptive or generic words when you choose a trademark. Remember that your goal is to bring uniqueness. Coffee shops for coffee bars, Coolers for Refrigerators are some of the examples of descriptive words. Descriptive words directly identify the nature of the products or services without imagination, thought, or perception. Trademark registration cannot be fulfilled with descriptive marks. It is difficult to register and to prevent others from using merely descriptive marks because of the competitive need to describe products and services accurately. Since no one can have a monopoly right on a geographical name, common personal name or surname, it is better to not use them. For example, registering CHAMPAGNE for wine would likely be unsuccessful as it is a well-known wine region. Such surnames and geographical names can be registered only if it has acquired distinctiveness through advertisements and long use. Like coined or fanciful word, arbitrary or suggestive words are inherently distinctive and immediately entitled to protection as trademarks. Arbitrary words mean marks that contribute no meaning to the goods being described. APPLE is a well-known and popular arbitrary mark for computer equipment. A suggestive trademark is one that suggests or hints at but does not describe, the qualities or characteristics of the product. WORDPERFECT is a good example of the suggestive trademark. It is a famous word processing software. If you want your business to be really unique and distinctive from your competitors in the industry, think well and invent your own trademark which is purely fanciful. Never use words that will cause customers to be confused with other existing trademarks. One of my friends used “Dyarich” for his product of a diabetic solution. There was already one “Diarich” in the market in the same industry. The rest is imaginable. He faced objection from the later. So, to sum up, make sure that your trademark is distinctive as possible and is strong enough to be easily entitled to protection and trademarks.